HIS introduced a standard and overclocked version of the Radeon HD 5830. The standard card has a 800MHz GPU and 1GB GDDR5 clocked at 4000MHz, while the overclocked model features a 840MHz GPU and 4400MHz memory. 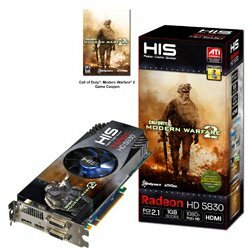 Both models are bundled with a Modern Warfare 2 coupon, which will also be bundled with the company's other 5800 iCooler V series graphics cards. Today HIS unleashed the revolutionary new HIS RadeonTM HD 5830 iCooler V 1GB GDDR5 Turbo and Standard version. Combined with the high performance dual slot iCooler V and stellar overclocking performance, it delivers most affordable high performance graphics with ATI Eyefinity technology supported. Prepare to plug in for a ridiculously immersive HD gaming experience unlike anything you've ever seen! iCooler V features a high performance dual slot cooler. It comes with excellent cooling setup, which transfer heat effectively from the GPU to the internal fins around the central fan. Thanks to the elegant design and smoothness of iCooler fan shroud, massive amount of cool air is drawn from the central cooler to cool down the internal fins directly. Heat from the 5830 GPU can rapidly transfer through specially designer fansink to fins that extend beyond the cooler. The optimized iCooler V fan shroud design allows airflow to pass in and out and removes heat effectively. Powered by the top-of-the-line 5830 GPU, HIS RadeonTM HD 5830 1GB GDDR5 accelerates PC gaming with nearly 1.79 TFLOPS computing power! Running at 840MHz core clock speed and 4.4Gbps memory clock speed (800/4Gbps for Standard), the HIS RadeonTM HD 5830 Turbo ensure extreme game play at high resolutions and maximum settings, and deliver full support for Microsoft DirectX® 11 graphics and compute functionality. Besides, it features an architecture tailored to excel with DirectCompute 11 (Shader Model 5.0) and OpenCL, taking ATI Stream functionality to next level. What's more? HIS RadeonTM HD 5800 series introduces ATI Eyefinity Technology, allowing gamers to expand their immersive experience over multiple displays. With startling panoramic capabilities it give you a staggering sense of height and speed. Along with support for Windows XP and Vista, RadeonTM HD 5800 comes with fully complaint support for Windows 7. Also ATI Stream technology enables general purpose GPU computing on HIS graphics card. That means you can run some demanding software faster than ever before." Featuring the innovative 40nm manufacturing process technology, the HIS RadeonTM HD 5800 reduces power consumption dramatically while delivering many technology breakthrough. It offers superb scalability with it's CrossFireXTM multi-GPU technology. You can multiply and conquer every gaming titles in the market!